Much anticipation surrounds the hours prior to the start of trick or treating. This is truly a child’s event – an evening filled with collecting goodies from neighbors. We offer some safety tips to make sure the evening stays fun and festive. We’re going to state the obvious, sometimes we need these simple reminders. Trick-or-treat with another child or family. We enjoy trick or treating as a family; we spend the first half of the night receiving candy and the second half giving out candy. Stay in your neighborhood. For safety reasons, visit homes you are familiar with. Go to homes that are well lit. If the lights are out, they either ran out of candy or do not want to participate in the festivities – bah humbug! Use sidewalks and driveways. Avoid running through grass as you never know what could be on the ground, e.g., dog poop or sharp objects. Use the crosswalks or cross at the corners. Halloween night is a busy night in our neighborhood. Running into the street in between two parked cars can be dangerous! This is a tough one – walk as opposed to run to each home. Of course, I was the child with the pillow case running from one home to another. Clearly a case of the – do as I say not as I did. Carry a flashlight. The five & below store has Halloween themed flashlights that are quite affordable (the name says it all). They may not work the next day but then again they may not make it home either (my children are notorious for losing items of this nature). Be cautious of strangers – this should be an ongoing safety tip / conversation. At every annual checkup, my pediatrician reminds my children about strangers. Make sure you also talk to your children about strangers. 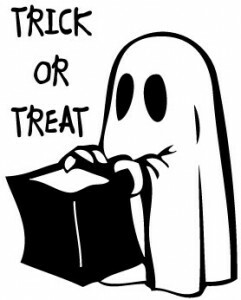 Prior to hitting the street, remind your children of their manners and make sure they say, “thank you.” Your child is receiving free candy! Check candy before eating it. Throw away any candy that has been opened. Last but certainly not least, have a fun evening. Remember, Halloween only happens once a year.